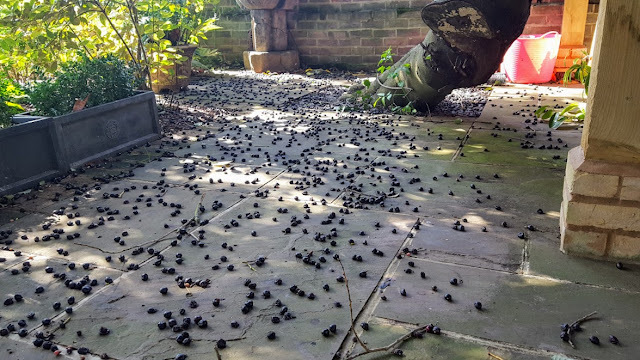 They look like cherries and, when they are lying on the ground fermenting, they smell like rotten cherries. However if you have young kids or idiot dogs around, whether the fruits of the Cherry Laurel are poisonous or not is probably a question that is likely to cross your mind. Especially when you consider the huge amount of fruit drop you can get from a single mature specimen. Native to southwestern Asia and south-eastern Europe, and sometimes commonly known as the English Laurel by the Americans (I don't understand why either), the cherry laurel - Prunus laurocerasus is an large evergreen shrub or small tree grown for its large, glossy, leathery foliage. It is a widely cultivated ornamental plant most often used for hedging which accounts for why there are so many large, fruiting specimens around. Surprisingly for many plant common names, the name 'Cherry laurel' is surprisingly accurate as not only are the fruits cherry-like in appearance, this species is indeed from the genus Prunus where all the ornamental and edible cherry species and cultivars reside. So if the Cherry Laurel is so closely related to edible cherries that that mean that the fruits are not poisonous? Well both the foliage and the fruit stones contain cyano-lipids which are capable of releasing cyanide and benzaldehyde when ingested, particularly when chewed. The fruits themselves are edible although rather flavourless and somewhat astringent. To a lesser extent the fleshy fruits also contain small amounts of hydrogen cyanide but usually not enough to cause any ill effects. That being said, if any of the fruits do have a bitter taste to them then they should be avoided as this is indicative of larger concentrations of hydrogen cyanide being present. So to conclude, Cherry Laurel fruits are not usually poisonous but sometimes they can be, and the leaves and stones always are. ARE CHERRY LAUREL FRUITS POISONOUS?